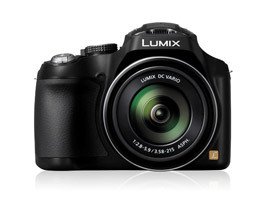 Panasonic Lumix DMC-FZ70 review: Ultimate everyday point and shoot? Compact ‘super-zoom’ cameras have been offered with optical zooms featuring greater range year-after-year. This new stabilized model from Panasonic, the Lumix DMC-FZ70 has a massive 60x zoom range, the equivalent of a 20mm wide-angle to 1200mm super-telephoto. Physically small sensors from compact cameras are used to keep the models relatively compact, and in this case the FZ70 has a 1/2.3-inch type BSI MOS type with ISO100-3200 (with expansion to ISO 6400) sensitivity and new processor for a 3-shot 9 fps burst. Although the rear 3-inch 460k-dot LCD is fixed and that and the built-in 202k dot electronic viewfinder have a relatively low resolutions, the FZ70 has a promising video capability; recording 1080i AVCHD video at 60 fps and 1080p at 30fps in MP4. The Panasonic Lumix DMC-FZ70 measures 5.1 x 3.8 x 4.7″ / 130.2 x 97.0 x 118.2mm and weighs 1.33 lb / 606 g with battery and memory card, and is available now at $349. 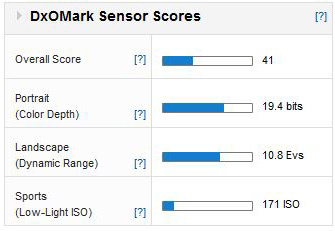 With a DxOMark score of 41 points the FZ70 attains a sensor performance ranking of 221 overall. With a color depth of 19.4 bits, a 10.8 Ev dynamic range but a respectable 171 ISO low light score, the ranking is slightly below average for a small sensor compact camera. 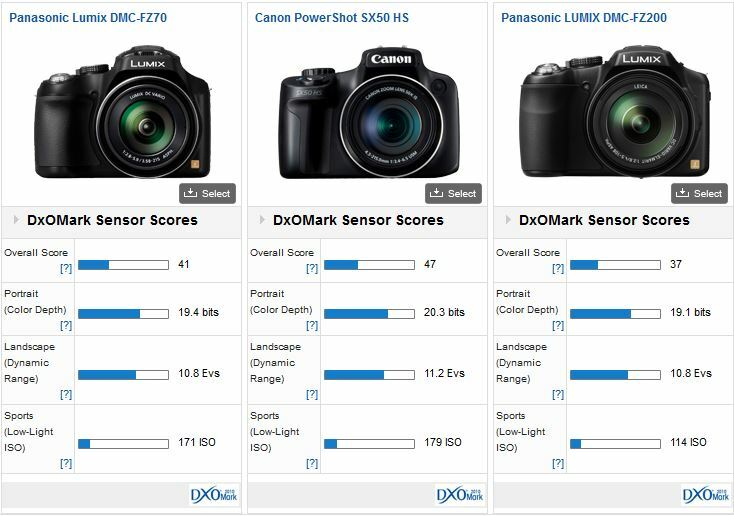 The best performing model in our database is the Canon PowerShot S120 – albeit with a slightly larger 1/1.7-inch type sensor – with a DxOMark score of 56 points. Compared with the Canon PowerShot SX50 HS, a $339, 12.1-Mpix model with a stabilized 24-1200mm equivalent zoom, the FZ70 has -1/2 stop less color depth and around -1/2 stop narrower dynamic range, but similar low-light capabilities. Against the firm’s $409 FZ200 another 12.1-Mpix model only this time with a Leica branded constant aperture 25-600mm f2.8 zoom the two compare very similarly with the FZ70 even out-performing its sibling in low-light, by approximately +1/2 stop. Although the recently reviewed Sony RX10 has a superior sensor, at $1,300 it’s a good deal more expensive than the likes of the Panasonic Lumix DMC-FZ70. Also worth remembering is that the Panasonic boasts a much wider-zoom range though it’s unlikely to be able to match the Sony’s in image quality; and we’re currently unable to test lenses with such long focal lengths as the Panasonic’s. For travel photography or as point and shoot for everyday use the FZ70 is intriguing, but it is eclipsed slightly by more modestly specified rivals.